With the Bicorne English Civil War Catalogue and Rules the reader is given a very simple and enjoyable insight into the English Civil War. 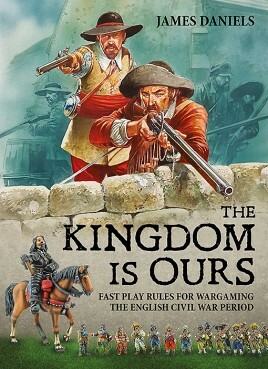 A compellingly playable set of fast play rules provide entertainment and challenge for both the novice and veteran players alike, entwined with glorious pictures of the Bicorne English Civil War miniature figure range. The rules have been extensively developed from the author's and friends' house rules. These were purposefully designed to provide a fast, fun and challenging game for wargamers of all abilities, whilst encouraging the education of the readers into the troops and the realities of warfare in the 17th Century. There are many parts to the book in addition to the rules, including an introduction to the Civil War written by Linda Doyle, and a section detailing troop types and uniforms. This has all been designed alongside the catalogue of Bicorne troops where the reader is encouraged to collect and paint an army of model soldiers, with a view to playing enjoyable wargames with friends. To this end there is a section on how to build up your army if you are new to the period, as well as a couple of scenarios to give the reader a good idea of what can be achieved with this fun to play set of rules. What Did You Do In The War, Grandfather?